This National Trails runs 93 miles (150km) through Norfolk. As its name suggests, it is in reality two paths, of very different character: the Roman Peddars Way, practically dead straight across the lowlands of rural Norfolk; and the path along one of the most remote coastlines in England. Dave Travers and I walked the path in 1999 and 2000. We took the Peddars Way on occasional Saturdays, and the Norfolk Coast as a three-day excursion in June 2000. 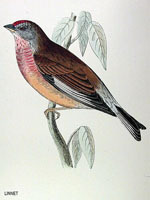 As well as the usual route information, this page give you information on bird life for the coastal stretches. This walk runs through Breckland, the driest place in England and one of the driest in Europe. It drizzled. Breckland was formerly heathland, though much is now forested, and on this walk you will see the tank tracks from a local military base. 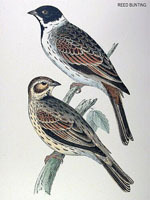 But much of the older habitat will still be seen. We started by sheltering from a brief snow flurry. It is not perhaps the most stimulating stage of the Way, with much of the walk being on the verges of public roads, but a great compensation is the village of Castle Acre. One of the highlights of the trail, the village occupies a strategic position by the Nar, one of Norfolk’s principal rivers. Here are ruined priory and castle, both Norman, with the old castle ramparts especially worth exploring. There were two good pubs, plus eating places and interesting shops. Set compass for 335 grid north, walk for 13 miles, end. Perhaps the straightest walk since the days of the gladiators. Not without interest, for all that. This day traverses slowly rolling countryside in one of the least populated parts of southern England; there is a genuine feeling of remoteness, with no more than three or four houses actually passed on the walk, and the one village nearby – Great Massingham – barely visible. We parked up at Fring church, just off route. It’s remarkable how churches are still great navigation points, especially in country like this. Strictly, the end of the Peddars Way and the start of the North Norfolk Coast Path, the latter taken east to west; we would later take the rest of the coast path west to east. This was a beautiful late spring day, with a good pub midway – the White Horse at Holme next the Sea – and an excuse for an ice cream at the seaside town of Hunstanton. First, through the dunes to Thornham. They bear an unusual sign concerning local wildlife (see left hand pic below). The path then diverts inland which at least permits a wider view of the coast. From Brancaster, a wild stretch looks out to Scolt Head Island between the Burnhams Deepdale and Overy Staithe, where we stayed overnight. This is Nelson country; Horatio Nelson, the hero of Trafalgar and with Drake England’s greatest naval hero, was born just inland at another of the Burnhams, Burnham Thorpe. A tremendously varied walk that shows off this great coastline to best effect. Any number of highlights: before lunch, the beach of Holkham Bay, backed by pine dunes, before the small town of Wells next the Sea, where we diverted into the town for lunch. 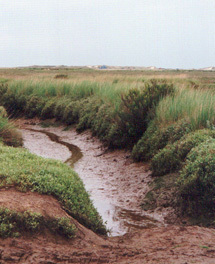 There are long stretches of salt marshes around Stiffkey, before the busy little tourist village of Blakeney is reached. From Blakeney, there’s a sea wall walk to Cley, looking out to the shingle spit of Blakeney Point. Social history note: it is difficult for those in the local low-wage economy to buy houses, as prices have been forced up by those looking for a second home. 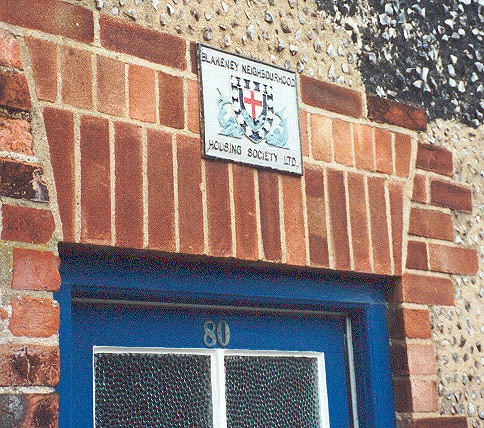 Perhaps in Blakeney this is no recent thing; a housing association specifically for locals was set up in 1946 to provide affordable housing for local people, which it still does, with 39 houses and cottages in Blakeney and neighbouring villages. The relative lack of humanity’s traces make this a great area for other fauna, with seal colonies around Blakeney Point (ferries from Morston as well as Blakeney) and bird life in abundance – see Dave’s birding notes below, made across the three days but principally this section. To the highest point of Norfolk! All of 105 metres (346 feet). But first, some of the most arduous walking in southern Britain – seems strange to say, for a three mile coastal stretch. But this is the notorious shingle beach from the coastguard lookout at Cley to Weybourne Hope. You can choose whether to walk on the bank or the beach – I chose the former, Dave the latter – it’s still like walking in porridge, sucking back your boots. And all the while, the hypnotic roar of surf breaking on stone. The low cliffs to the small resort of Sheringham are something of a relief. 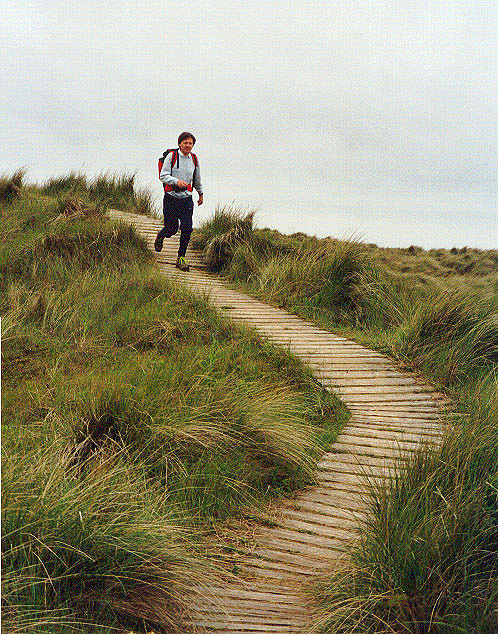 From here to Cromer, the path runs inland, much through woods, to the high point viewpoint. 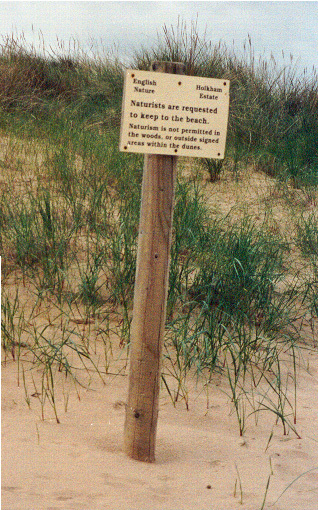 Signs hereabouts warn of adders, Britain’s only poisonous snake. 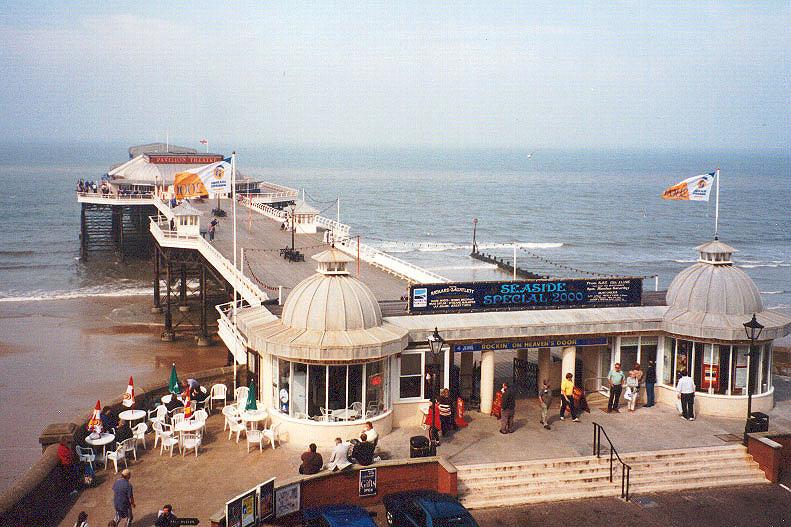 Cromer is a good end point; a Victorian resort that still has great character, including one of the most famous pleasure piers in England – as distinctive a finish as one could wish. There is a small car park at Knettishall Heath, the official start of the path, just inside Suffolk. The nearest town is Thetford, with trains on the Cambridge to Norwich line, four miles away. There is no bus service direct to the start of the walk. Things don’t get better quickly. East Wretham, where we had lunch on day 1, has two or three buses a day to Thetford and that’s nearly as good as it gets on the Peddars Way. 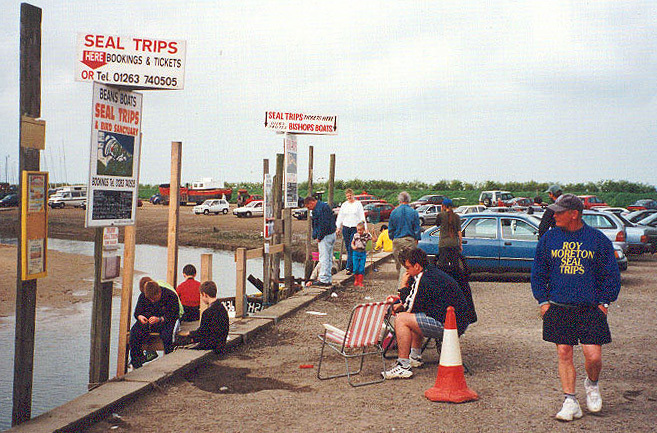 Back in 2000 when we were at Castle Acre, it had a regular service to Swaffham; now, thanks to ‘austerity’ and its unrelenting drive in the service of rural isolation, it’s served by just two buses a week, to King’s Lynn, though things are a little better at Great Massingham, a mile to the east in the middle of our day three, which has three or four buses a day between Fakenham and Kings Lynn. The position is better on the Norfolk Coast. Hunstanton has a good bus service from King’s Lynn. Then there are decent bus services along the A149 Hunstanton to Cromer road, linking almost all the villages of the Path. You might be able to use them to be based in Wells next the Sea for the three or four days it takes to walk that part of the Path. At the western end of the Path, Sheringham and Cromer both have a roughly hourly train service to Norwich, which we used to return home. In Burnham Overy Staithe we stayed at the Domville guest house, which as of 2018 seems to be no longer listed. 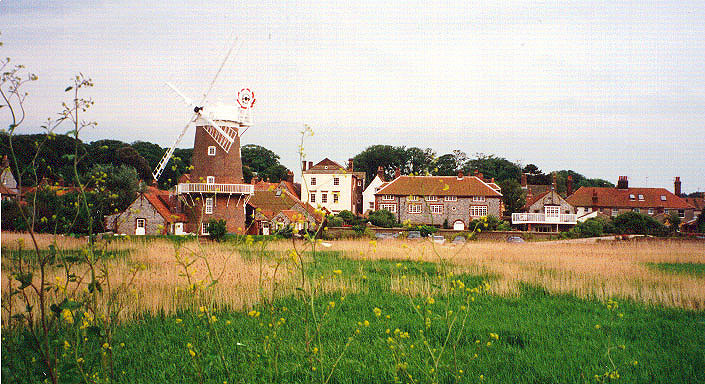 However our hotel in Cley, the George, is very much still up and running. To find accommodation, the best place to start is the ‘Plan your visit’ section of the National Trail website. 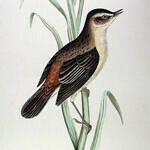 Dave is a keem ornithologist, and he has contributed these notes of some of the species seen along the coast.